Size: 665 sq.ft. - 900 sq.ft. Codename Platinum Vogue is a new residential project registered under RERA -P5180001451. The project is being developed by Platinum Corporation in a well-developed residential area Andheri, Mumbai over 2 acres of land. This residential complex was launched in September 2018 and possession is expected by end of 2024. Among other residential developments of Mumbai Codename Platinum Vogue will be one of the highly demanded projects. It will be offering both 2 Bedroom and 3 Bedroom advanced apartments. The two bedroom homes pricing at 2.12 Crore (Base Price) and three bedroom homes pricing between 2.45 crore to 2.88 Crore (Base Price). Here at Platinum Vogue community you will be noticing many benefits under one roof. The key attractions of Codename Platinum Vogue are Ground level amenities spanning over 11,000 Sq.ft and the sky bridge spanning over 20,000 Sq.ft of area. There will be 4 towers in this newly launched project where it going to house more than 270 apartments of 2 BHK & 3 BHK. These homes are designed as per vastu compliant facing parking area. The carpet area of Codename Platinum Vogue apartments will vary between 660 Sq.ft to 900 Sq.ft. Each iconic tower stands 15 floors high with exclusive lavishness for its occupants where they can enjoy stress free and peaceful life. These modern architectures are designed with Wooden flooring in Master Bedroom, Decorative Main Door and Internal door, Vitrified flooring in living/dining room & kitchen, kitchen and bathrooms will be fitted with proper fittings and fixtures. Platinum Corporation Group is very new in real-estate industry holds 8 years of experience and an established award winning construction brand at the same time. It was formerly known Pentium Infotech Ltd and later in June 2007 the named was changed to Platinum Corp Ltd. Platinum Corp is focused on delivering home for modern day urban inhabitants in the high - growth residential destination. Other than real estate the company is engaged in the sales and investment of Shares. In this short period of time the company has proven a strong track record of delivering projects on time with support of their highly real estate professionals. Platinum Corporation Limited is fulfilling home buying dream of many by releasing and delivering affordable residential properties in various locations of Mumbai. 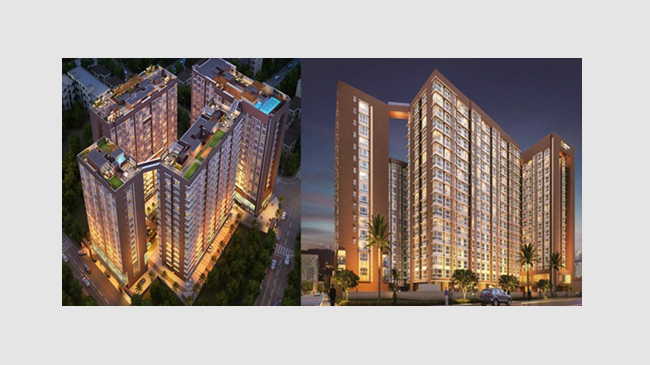 Platinum Corp has selected a right location for their latest project Andheri West. Andheri which is the most sought after suburb of Mumbai due to its commercial, residential and retails projects. Malad Creek, BMC Road, Jogeshwari and Goregaon area located near to Andheri. It is also in the vicinity to various production studios & houses like Sony Entertainment, NDTV, Sahara TV, Balaji Tele Films and it is also close to SEEPZ (Santacruz Electronic and Export Promotion Zone). SEEPZ is home to various Pvt Ltd companies like Global Link Solutions and Bizz India Pvt Ltd etc. The very famous recreation centres such as Versova Beach, Club & Nana Nani Park are within Andheri location. Andheri West is most preferred destination for shopaholics as there are number of shopping options. These major advantages make Platinum Vogue one of the promising residential projects. The Platinum Vogue is located right opposite to Shree Sambhunath Bhagwan Jai Mandir at D.N Nagar, Andheri West, Mumbai, Maharashtra - 400053. Platinum Vogue is popular trend inspired residences community is loaded with super luxurious amenities like Sky Swimming Pool, On call Chauffer & Butler, Rooftop Yoga Zone, Kid's Play Area, Lavish Car Parking Space, 24/7 Security, Landscaped Garden, Power Backup, Video Security, Lavish Entry Gate, Rain Water Harvesting, Clubhouse, Gymnasium with a personal trainer, Maintenance Staff, Outdoor Party Zone, Elevators, Unisex Salon, Organic Mart, etc. Schools – Ryan Global School, Indian High School, Hansraj Morarji Public School, DN Nagar Municipal School, Pragat Vidya Mandir. Colleges – Sardar Patel College of Engineering, Institute of Business Management Studies, SP Jain Institute of Management Search. Parks – KP Udyan, Prajakta Udyan, BMC Garden, DN Nagar Play Ground. Hospitals – Sujay Hospital, Khubchandani Hospital, Siddhi Vinayak Hospital, Gulmohar Park Hospital. Railway/Metro Stations – Andheri Station, D.N Nagar Metro Station, Versova Metro Station, Azad Nagar Metro Station. Bus Stops – ESIC Nagar, New India Vasahat, Indian Oil Nagar, Four Bungalow Market. Shopping Malls – Hira Panna Mall, City Mall, ARK Mall & Shopping Centre, Infinity Mall. Airports – Santacruz Domestic Airport, The Chhatrapati Shivaji International Airport. 750 sq.ft. - 1393 sq.ft.